What better way to greet visitors in your garden than with a bench! 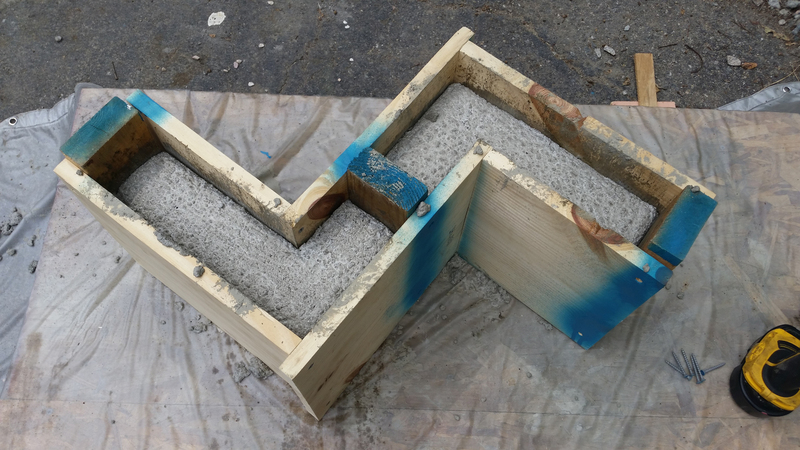 Yes it is possible to create your own concrete bench for under $20. 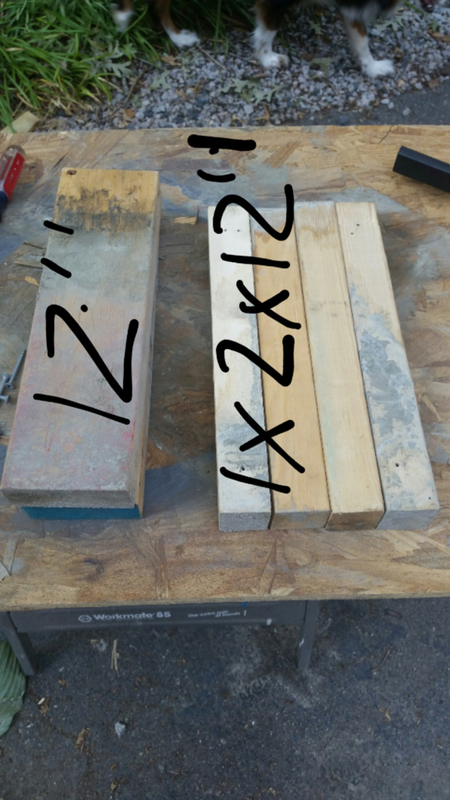 If you have no wood lying around then you are still going to be under $30. The one pictured to the left has a metal Welcome sign that you can find at Hobby Lobby for less than $3 with their 40% coupon. 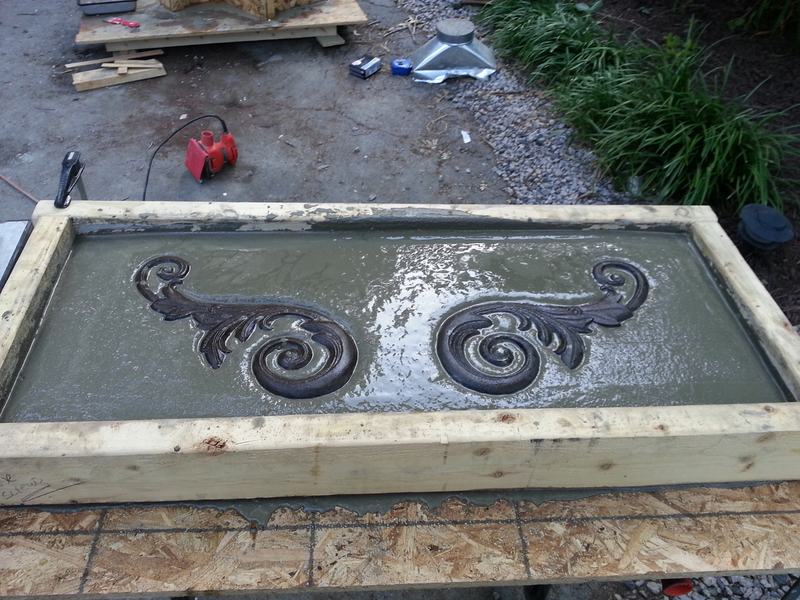 The wood frame/molds for this project can be used over and over to create more benches for family and friends. What a great gift idea for the gardener in your life! 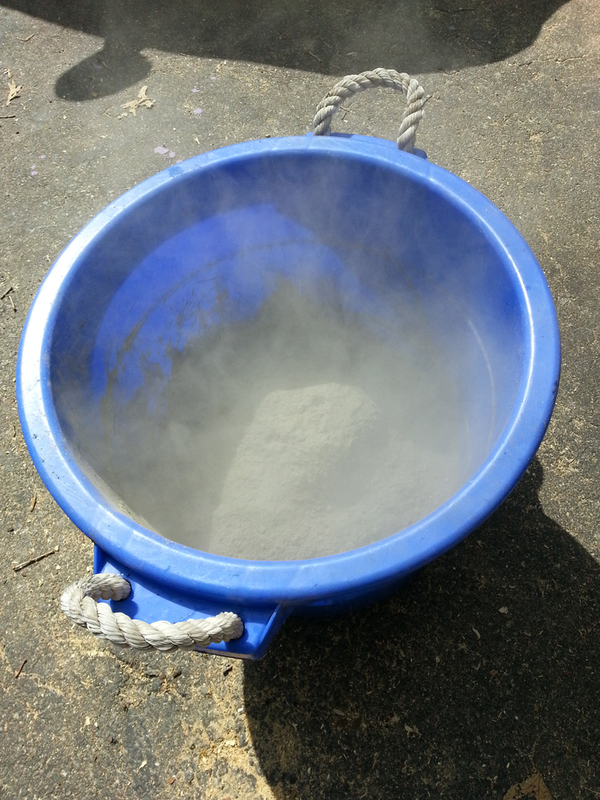 The concrete mix I used is less than $6 a bag at Lowe’s. 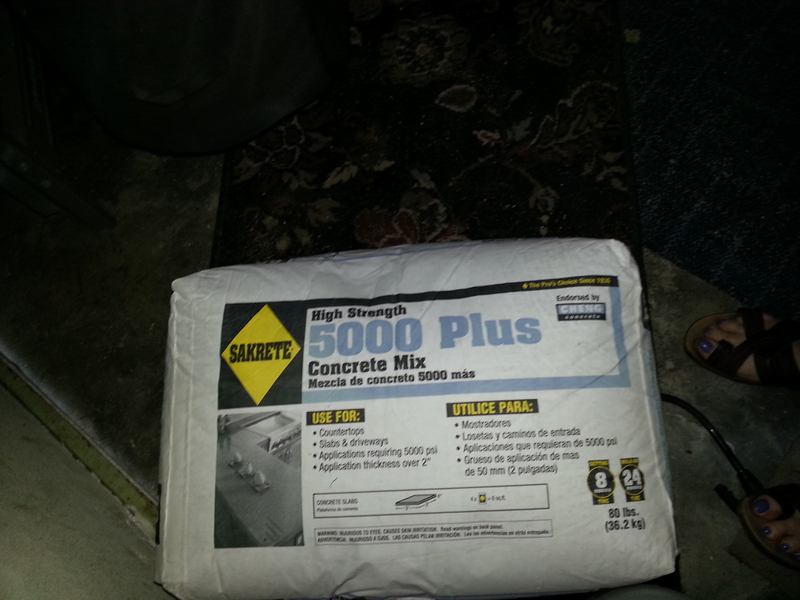 I used Sakrete 5000 which has fibers and is rated for sidewalks and countertops 2″ thick. 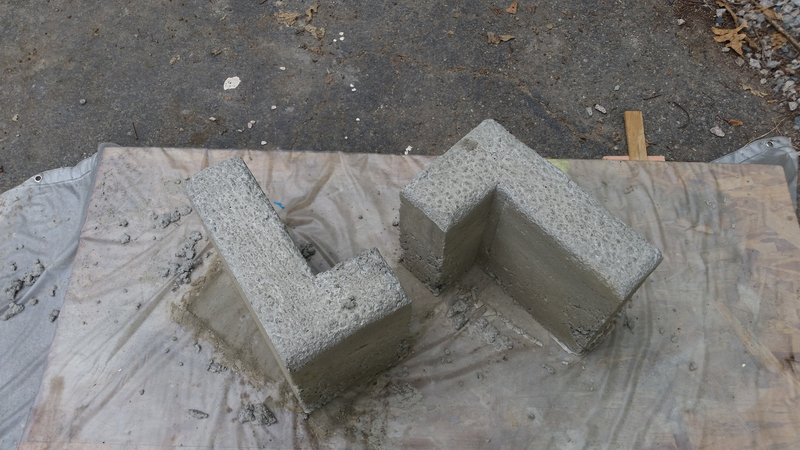 One bag does one bench top or base and I feel would be the best concrete mix for this project. 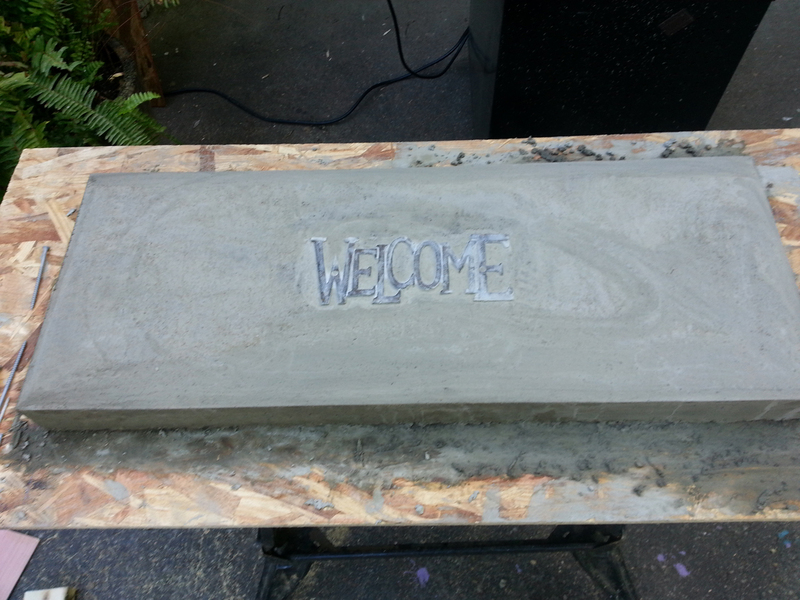 You may also want to add rebar which is sold in the concrete section to reinforce the bench top and the base if your bench will be located where someone may sit. We did benches both ways and sat on each and they did not crack or break (and we are no light weights). The bench cures for at least 8 hours before you take off the base and then you can place it in the garden after the concrete has cured for 24 hours. 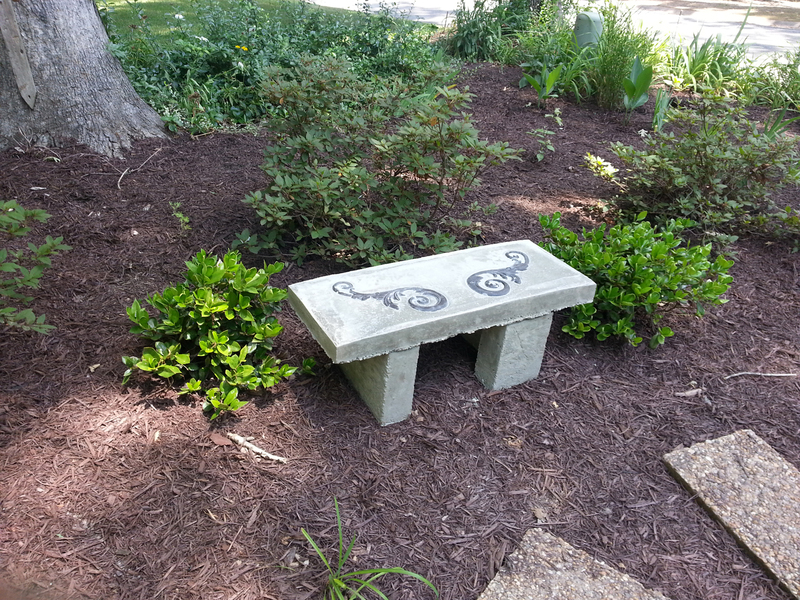 You may want to sand, grind, and remove some of the rough edges underneath the bench. After a week the bench should be ready. 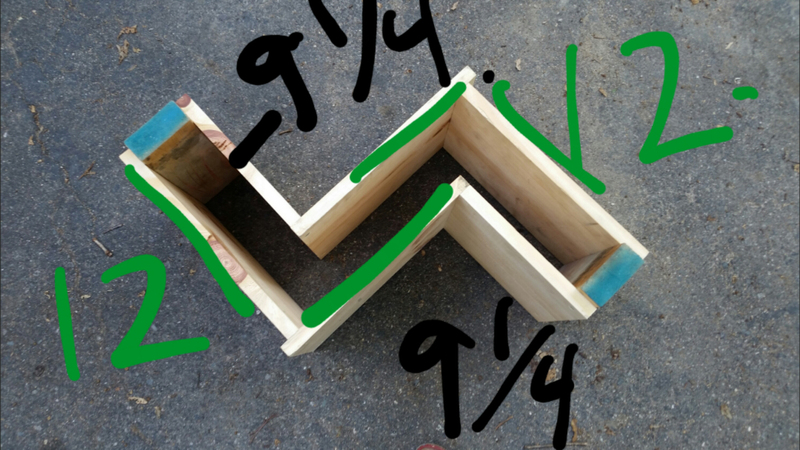 Build the molds/frames first and I have put pictures on here with dimensions for easy following. 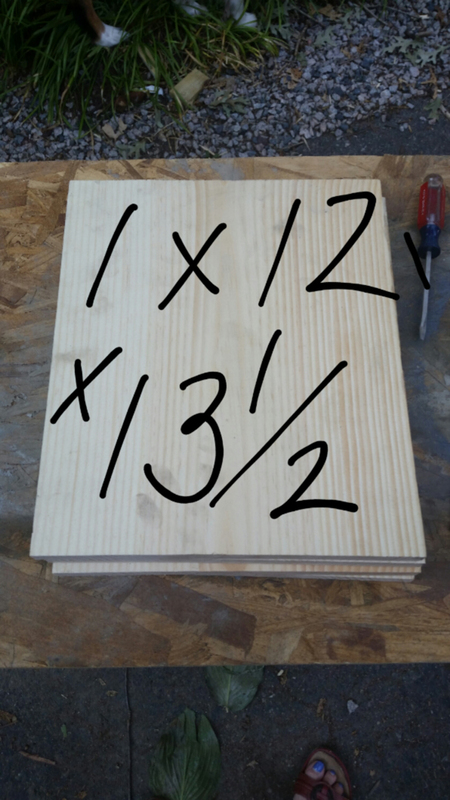 If you do not have a level surface to pour concrete on, then just buy a cheap $8 -4’x8′ of OSB plywood and have your local Lowe’s or Home Depot cut it down to about 4′ so you have 2 pieces-one for the bench top and one for the base. 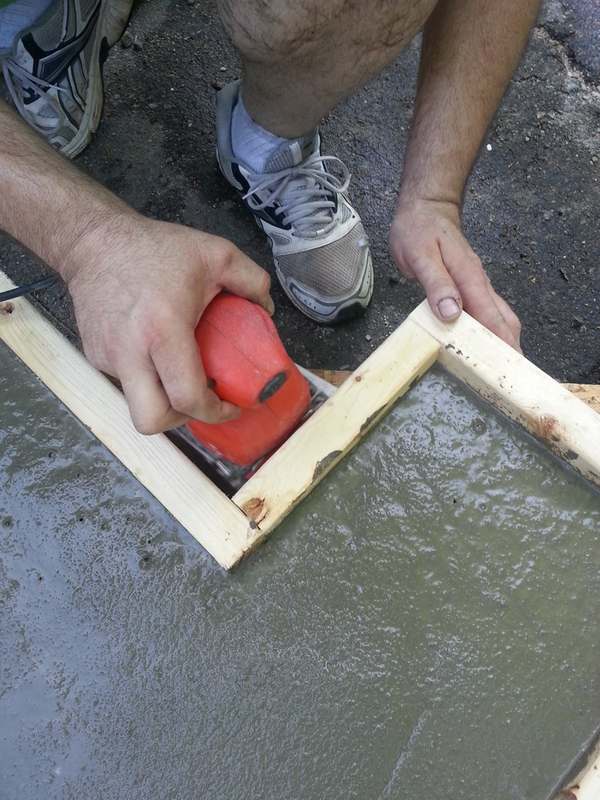 It is easier working on the ground pouring the concrete mix but a pain when you are trying to smooth it out. 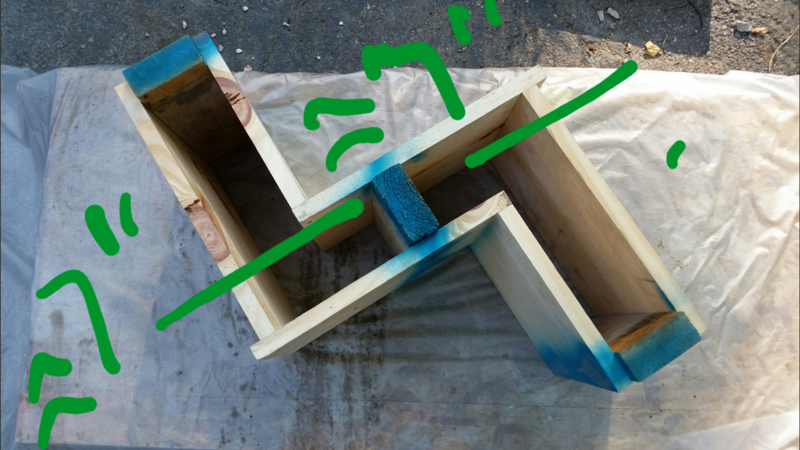 Try to get the surface you are working with as level as possible-does not have to be perfect. 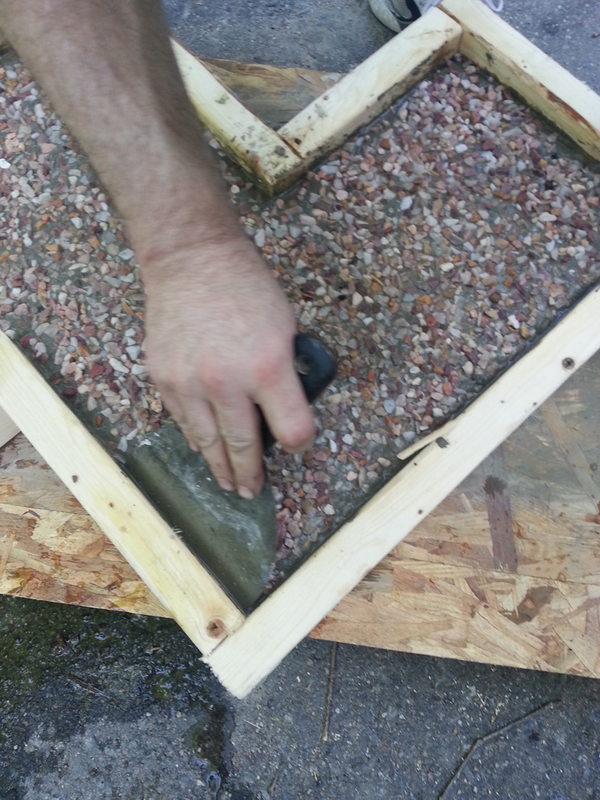 There is no easy way to mix the concrete so have someone help you. It is so much easier with 2 people and one being strong! 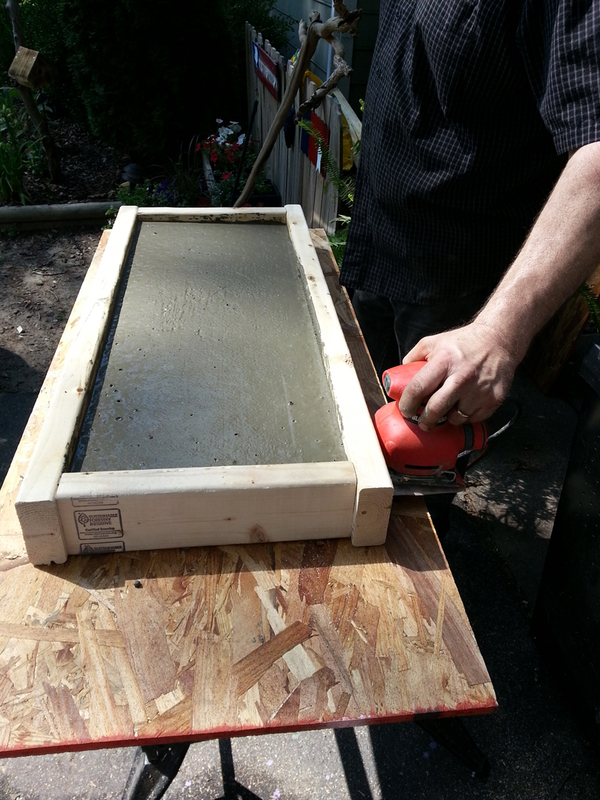 Take turns mixing the concrete and just add water slowly so that you do not get the mix too wet. Do not panic if you do and maybe let it sit and dry up some and keep mixing every 15 minutes or so. This project should not take more than 3 -4 hours to do. We have all the dimensions for you and putting it together should be easy. 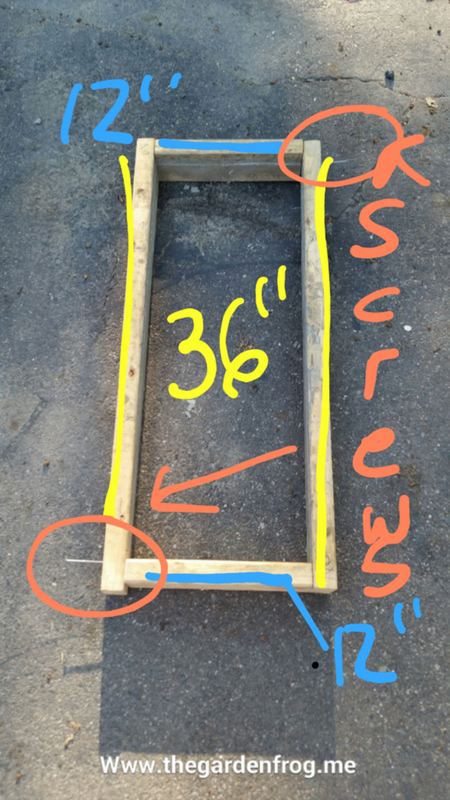 If you do not have a saw, take the dimensions to your Lowes or Home Depot where they should cut it for you. 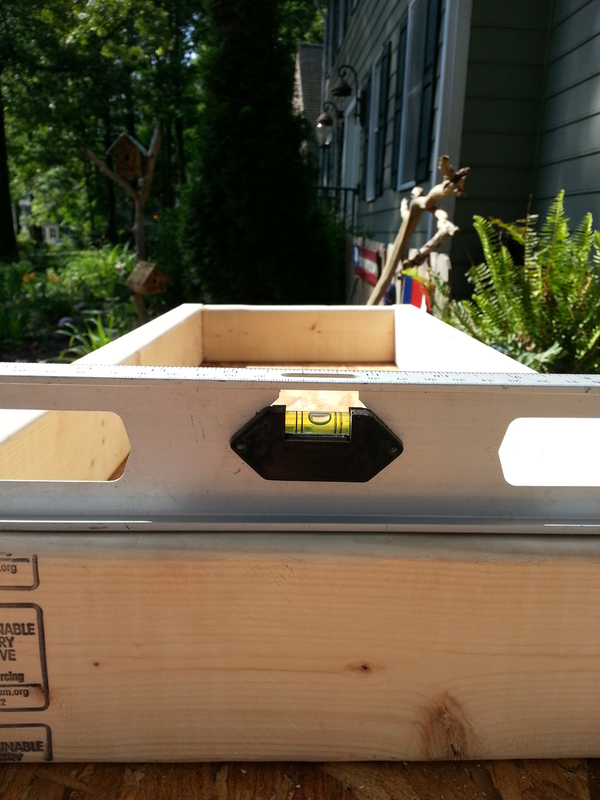 We used the 2nd time around a 1x 12 in pine which made it a whole lot easier. A large tub like this works great! Have a helper because 80lb concrete mix is heavy! What a great gift for the gardener in your life. 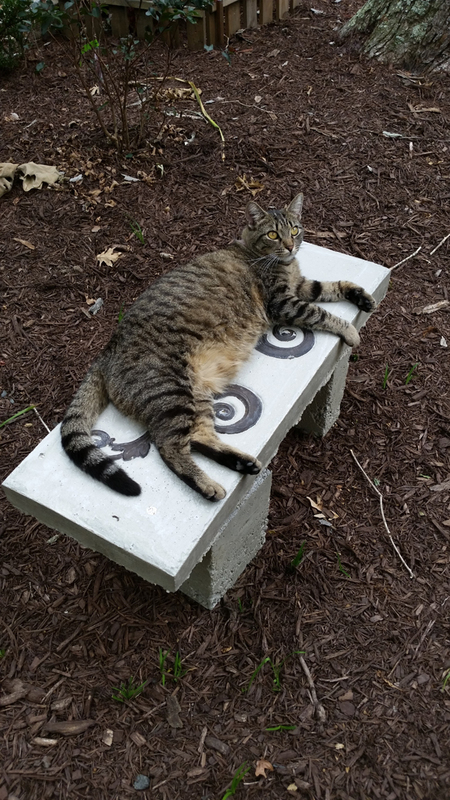 There are many variations out there for this bench that you could try-using concrete stain in the mix or even using tile to create a mosaic top. 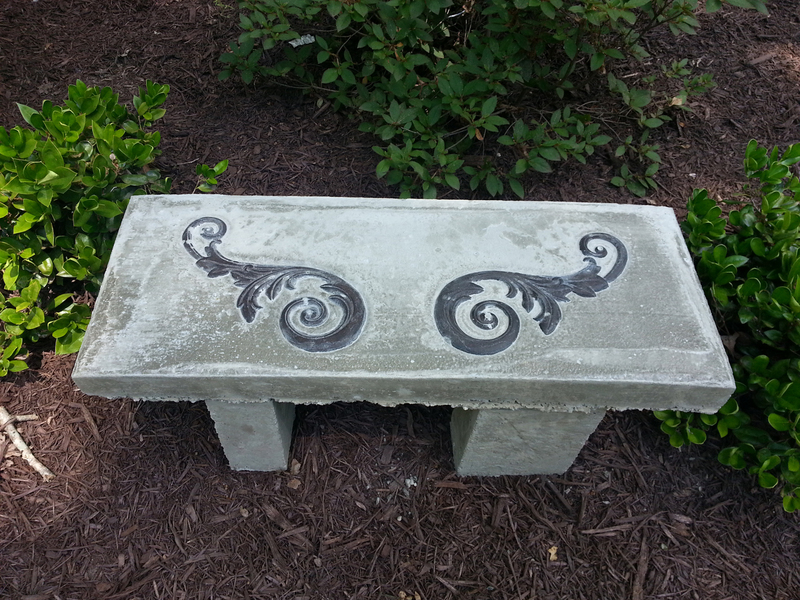 Endless possibilities for a one of a kind bench that any gardener will surely love.